From Backgammon Times, September 1981. "Communicate: To keep checkers within 6 pips of each other for mutual support. "Magriel, Backgammon. This brief yet accurate definition, found in the glossary of Magriel's tome on backgammon, is the only existing reference to the subject in literature. This is no surprise, as for years writers have preoccupied themselves with more concrete, dynamic, and tactical aspects of checker play. Communication is above all a positional concept and its implementation borders on a philosophical approach to certain positions as much as anything else. Therefore actual communication moves sometimes look nonsensical, and even antipositional. They are the "mystery" moves of backgammon. In spite of the vagueness of the tactic, communication is not a difficult motif. Communication is an idea that works under specific conditions and has distinct purposes and goals. Positions where both sides have numerous men recirculated and primes where control of the outfield is the predominant positional theme. Mutual support of the men. Deflection of the enemy men to points where their sphere of influence is diminished. To force or compel the opponent to move men he would otherwise have refrained from moving. It all sounds very abstract and indeed in some ways it is. Communication plays are moves which good players make on instinct as much as anything else. If you think of communication plays as "islands" of friendly forces "bridged" together by a thin "chain" of allies you have a good picture of our theme. Two examples follow. Diagram 1 illustrates our first "mystery" move. White has a 3-2 to play. Many players might have tried 24/21, 6/4 or 11/8, 6/4. Motakhasses's play 21/16 is a play whose motif is purely for communication. The position is undeveloped so his blots are not in any real danger. In the meantime his men bear on every sector of the board and "speak" to each other the length of a single die. This is a communications play possible under the conditions spelled out in 1a. An illustration of communication as described in 1b is shown in diagram 2. White has a 6-3 to play. 24/21, 13/7 looks so natural it is hard to imagine another play. The result of this play, however, is that White's forces become isolated from each other by half the board and the battle for the outfield is lost. All Black does now is leap into the outfield with his back men and wait for White's stragglers on the 22 and 21 points. Instead, White must bridge the gap between his forces by playing 24/21, 22/16. With this play, White's men "communicate" with each other, battle for the important outfield, and force Black to move men he would otherwise have left untouched. The next time you see a Thomchin or a Motakhasses senselessly throw his blots all around the board with what seems like total abandon, take a second look. They may be trying to communicate. Mr. Senkiewicz says that Magriel's is the only existing reference to the subject (communication) in the literature. Not so. For openers, vide footnote on page 44 of Championship Backgammon by Barclay Cooke and Rene Orlean in the matter of "lines of communications." I have not gone through the entire book again looking for further examples, but we know that Mr. Cooke, at least, hammers home what he considers to be vital points again and again in all his works. This is probably no exception. Or take Problem 39 on page 65 of Joe Dwek's Backgammon for Profit. While the precise word, communication, is not used, the suggested solution to the problem quite obviously is based upon that concept. My sense of Mr. Shack's letter is that it is complimentary, and for that I am grateful. Unfortunately, I believe his criticisms are incorrect. For instance, in Championship Backgammon page 44 (Diagram 3) with White to play 5-4, Cooke recommends making Dwek's five point rather than hitting the enemy man on the 16 point. He asserts that the hit would still allow Dwek "lines of communication" between his hit man and his defensive point on Cooke's bar. "Lines of communication" in this context means that hitting would allow Dwek to recirculate his hit man and maintain his timing in the position. Since the diagram shows the wrong side on roll, it hardly illustrates communication as cited in my article. Furthermore, I failed to find any further references to this subect in Mr. Cooke's excellent book. 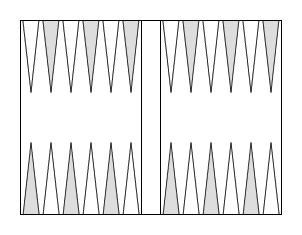 Mr. Shack's claim that Problem 39 in Backgammon for Profit (Diagram 4) refers to the topic without using the precise word, communication, is again incorrect. Backgammon for Profit, Problem 39. Dwek gives making the enemy bar by White as the correct move instead of 20/15*/13. His reasons were (a) hitting would permit Black to play a backgame by rolling a three, (b) making the bar assures White's lead in the racing game, and (c) White's man on the enemy two point is not stranded (communication perhaps?). Come now, to cite this as an example of communication requires a leap of the imagination that just won't hold up under analysis. By the way, I disagree with Mr. Dwek and feel strongly that the correct play is 20/15*/13. Hitting increases White's control of the outfield, widens his lead in the race, and makes it very difficult for Black to win by going forward. Good players are afraid to play backgames, not to play against them.